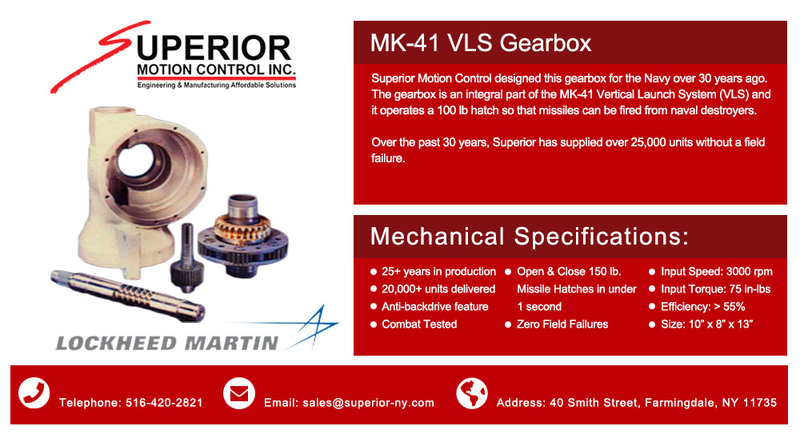 Superior Motion Control designed this gearbox for the Navy over 30 years ago. The gearbox is an integral part of the MK-41 Vertical Launch System (VLS) and it operates a 100 lb hatch so that missiles can be fired from naval destroyers. Over the past 30 years, Superior has supplied over 25,000 units without a field failure. Open & Close 150 lb. 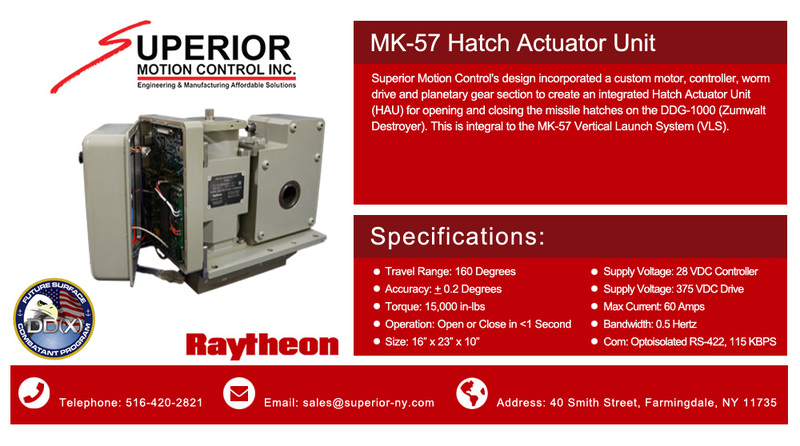 Superior Motion Control's design incorporated a custom motor, controller, worm drive and planetary gear section to create an integrated Hatch Actuator Unit (HAU) for opening and closing the missile hatches on the DDG-1000 (Zumwalt Destroyer). This is integral to the MK-57 Vertical Launch System (VLS). 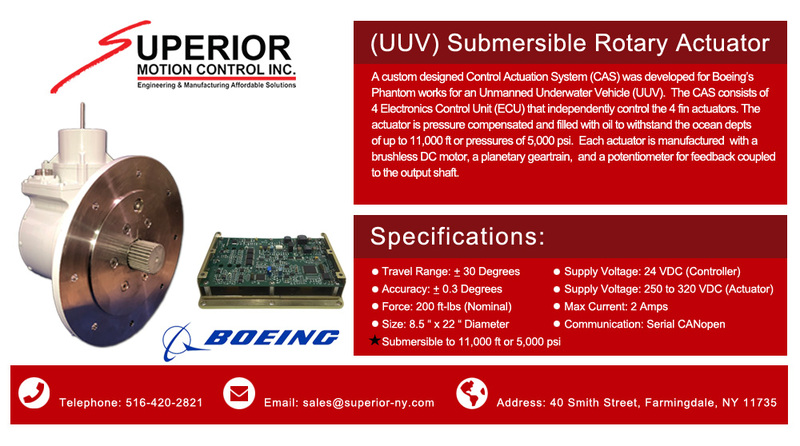 A custom designed Control Actuation System (CAS) was developed for Boeing’s Phantom works for an Unmanned Underwater Vehicle (UUV). The CAS consists of 4 Electronics Control Units (ECU) that independently control the 4 fin actuators. 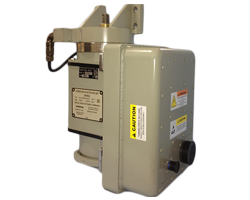 The actuator is pressure compensated and filled with oil to withstand the ocean depts of up to 11,000 ft or pressures of 5,000 psi. 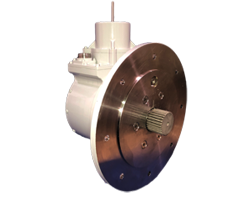 Each actuator is manufactured with a brushless DC motor, a planetary geartrain, and a potentiometer for feedback coupled to the output shaft. 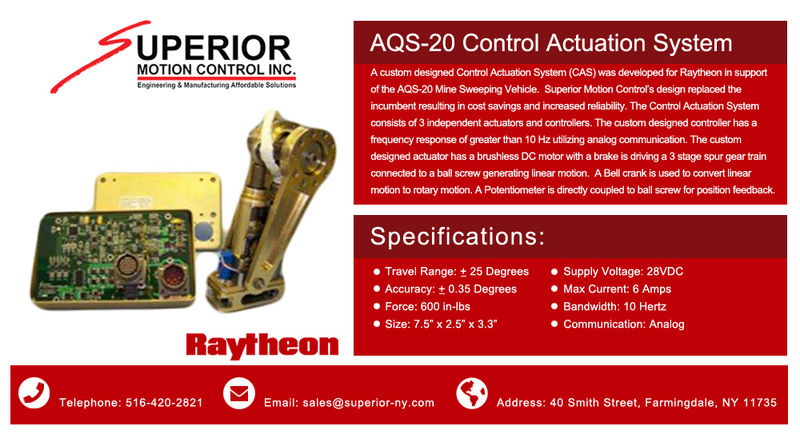 A custom designed Control Actuation System (CAS) was developed for Raytheon in support of the AQS-20 Mine Sweeping Vehicle. Superior Motion Control’s design replaced the incumbent resulting in cost savings and increased reliability. 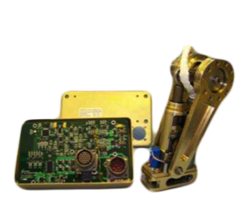 The Control Actuation System consists of 3 independent actuators and controllers. The custom designed controller has a frequency response of greater than 10 Hz utilizing analog communication. The custom designed actuator has a brushless DC motor with a brake is driving a 3 stage spur gear train connected to a ball screw generating linear motion. 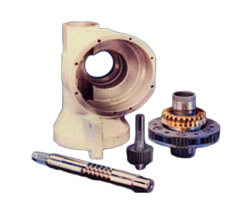 A Bell crank is used to convert linear motion to rotary motion. A Potentiometer is directly coupled to ball screw for position feedback. 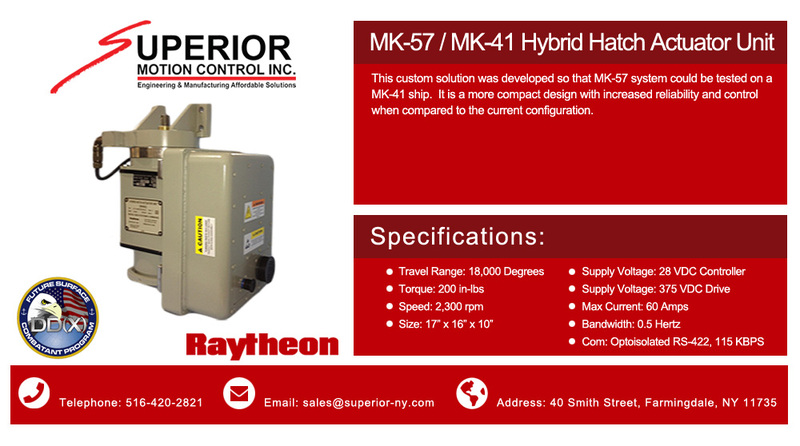 This custom solution was developed so that MK-57 system could be tested on a MK-41 ship. It is a more compact design with increased reliability and control when compared to the current configuration. 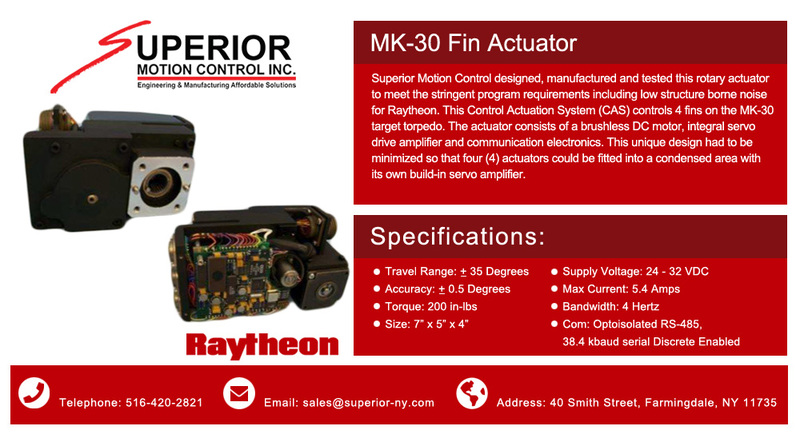 Superior Motion Control designed, manufactured and tested this rotary actuator to meet the stringent program requirements including low structure borne noise for Raytheon. This Control Actuation System (CAS) controls 4 fins on the MK-30 target torpedo. 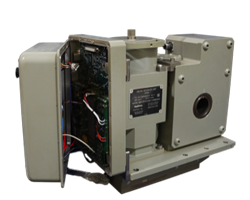 The actuator consists of a brushless DC motor, integral servo drive amplifier and communication electronics. This unique design had to be minimized so that four (4) actuators could be fitted into a condensed area with its own build-in servo amplifier. 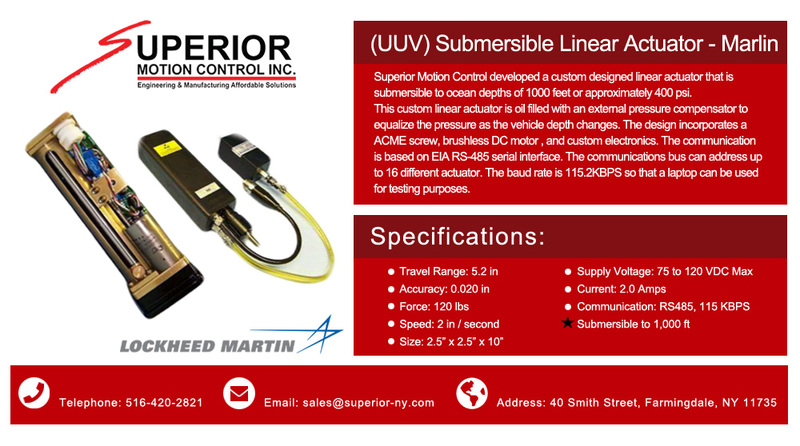 Superior Motion Control developed a custom designed linear actuator that is submersible to ocean depths of 1000 feet or approximately 400 psi. 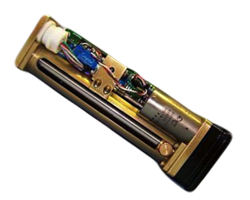 This custom linear actuator is oil filled with an external pressure compensator to equalize the pressure as the vehicle depth changes. 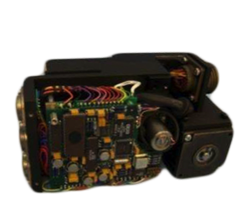 The design incorporates a ACME screw, brushless DC motor , and custom electronics. The communication is based on EIA RS-485 serial interface. The communications bus can address up to 16 different actuator. The baud rate is 115.2KBPS so that a laptop can be used for testing purposes. 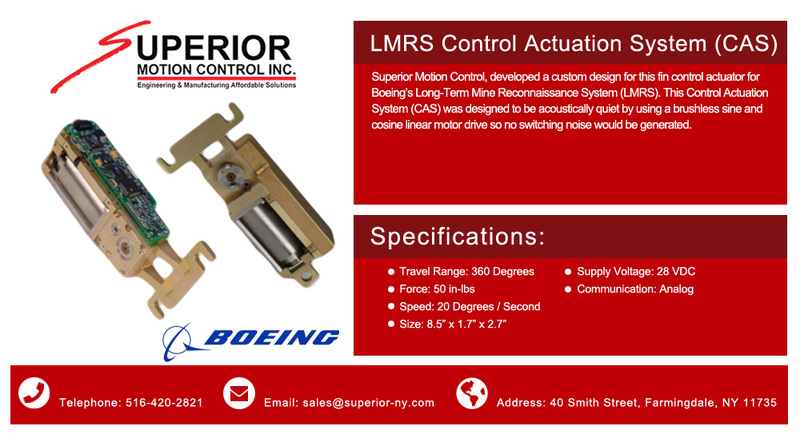 Superior Motion Control, developed a custom design for this fin control actuator for Boeing’s Long-Term Mine Reconnaissance System (LMRS). 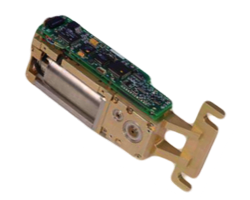 This Control Actuation System (CAS) was designed to be acoustically quiet by using a brushless sine and cosine linear motor drive so no switching noise would be generated.